The surface area of the departure hall has increased threefold. Now in Terminal A are located six document control points and nine gates, the functioning of which - in terms of information technology - GMT cares a great deal about. The increase in the number security check points and passport control gates for passengers has increased the airport’s capacity by nearly 50%, while maintaining a high level of security of travelers. The reconstruction of terminal A is not only about increasing the surface area of ​​the departure hall by 371 m2, but also its modernization. Because the renovation makes use of modern solutions, in the form of, for example, a new panoramic lift and escalator. These elements undoubtedly have increased the quality and comfort, as a lot of people during the ongoing holidays have already had the chance to find out. The project was quite a challenge, even for the industry-leading construction company Skanska S. A., which was the main contractor for the work. In addition to building new foundations and columns under the already mentioned escalator and elevator, of great difficulty was to perform all of the work, including the demolition and construction on a "living organism" - in the conditions of a fully functioning airport. Reconstruction and expansion of the low voltage installations could not cause disruption to the everyday activities of the airport. Terminal A is located between the technical heart of the airport, and the other two terminals, which have to function undisturbed, so work in this area requires close coordination between the general contractor and GMT, under whose supervision remain, among other things, the Airport security systems, visual and sound information. Cooperation, as usual, was successful and fruitful. All tasks were completed on time and with high standards. 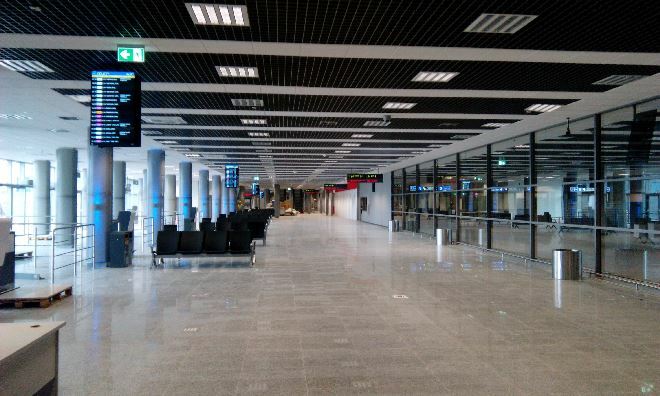 Terminal A, after modernization, functions and meets the expectations of even the most demanding passengers.